Does Kodi keep restarting or rebooting? In this guide, we’ll show you how to fix this annoying problem in just a few minutes, regardless of its initial cause. Kodi can be installed on a wide range of devices including Android, iPhone, and Amazon Firestick. Reboot loops are an issue that affects all platforms equally. Constant Kodi restarts are disruptive and frustrating but the good news is that while there are a few potential causes, all of these can be resolved fairly quickly. This guide will show you how to troubleshoot your rebooting problem and take action to fix it. Unless you’re experiencing additional Kodi problems, once the reboot loop is broken, there’ll be nothing left to stop you watching your favorite TV shows, movies, and sports coverage. Before we begin, it’s important to note that third-party addons and custom Kodi builds cause crashes far more frequently than official addons. For this reason, we advise our readers to use only official content sources and refrain from installing builds without a proper understanding of how they work. 2 Why does Kodi keep rebooting? 2.4 Problems with Kodi’s Database or UserData folders. Kodi users often employ virtual private networks (VPNs) to hide unlicensed streaming from their internet service provider (ISP). Despite this, VPNs provide many additional benefits for legitimate Kodi users too. All VPN network traffic is encrypted and cannot be seen by your ISP or a third party using a Man-in-the-Middle attack. VPNs also prevent your ISP from automatically limiting your network speeds based on your browsing habits. Every VPN will impact your network speed, but some services slow your connection to a crawl. Additionally, some VPN providers keep detailed logs of your internet traffic and purport to offer more anonymity than they actually do. For this reason, it’s important to choose your VPN provider very carefully. We recommend IPVanish. It’s a fast, stable VPN with servers in more than 50 countries. IPVanish keeps no logs of your activities and is the easiest VPN to install on multiple devices, including iPhone and the Amazon Firestick. READER DEAL: save 60% on an IPVanish annual plan here. IPVanish has a seven-day money back period and can be tried with no risk or long-term commitment. Why does Kodi keep rebooting? There are several things that could cause Kodi to reboot endlessly, but the good news is that this problem very rarely occurs on its own. Usually, the culprit is a recently installed addon or build and it’s fairly obvious which one is causing the problem. That said, we have created a step-by-step guide to resolving Kodi reboot loops when you have no idea what caused them. Like most software, Kodi stores small amounts of data in its cache for faster access. This cache usually empties itself but issues can occasionally that prevent this.. Usually, this problem manifests through slow, stuttering video but in extreme cases it can cause a crash/reboot loop. 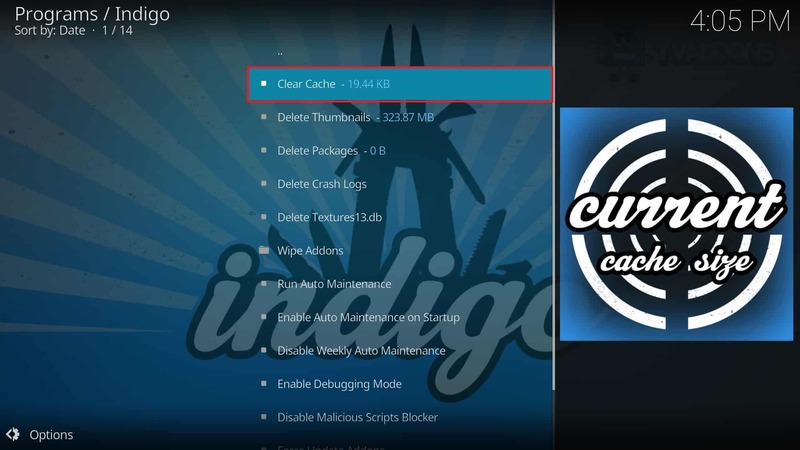 To manually clear Kodi’s cache, you’ll need the Indigo addon. Once it’s installed, open it and click the Maintenance tools option followed by Clear Cache. To the right of this option, you’ll see the current size of the cache. If it’s large, this is an indicator that something has gone wrong, but even small caches can contain corrupted files. Have you installed any new addons or builds recently? If so, try uninstalling them first. You can uninstall an individual addon by right-clicking its icon (or opening the settings menu from within the addon itself), choosing Information, then clicking the Uninstall button on the far right. Removing a build is a little bit more complex. 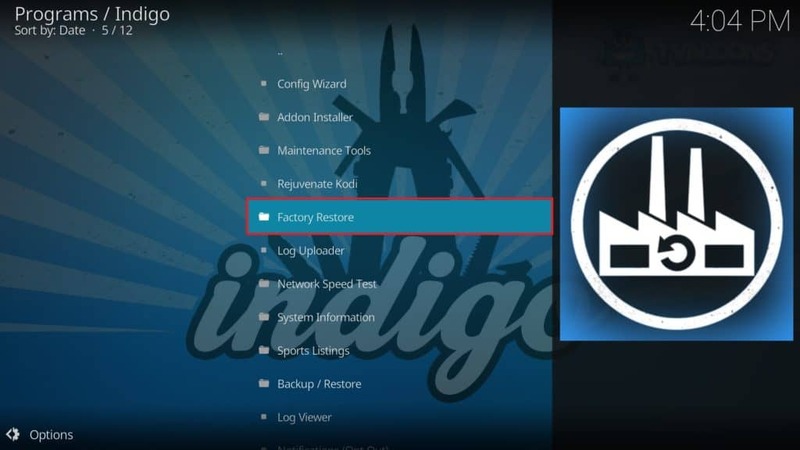 Kodi has no built-in way to do this, so start by installing the Indigo addon. Open Indigo then click the Factory Restore menu item. This will remove any installed builds and addons, restoring Kodi to its initial state. This process can take a few minutes so be patient. Once Kodi has been restored, check to see if the issue has been resolved, and if not, try uninstalling Kodi before downloading it again. The URLResolver is an addon that runs in the background and decodes file hosts. In simple terms, it’s the thing that finds the specific files that you want to access. If this addon is outdated, it can cause various problems including failed addon installations and of course, consistent Kodi reboots. Because the developer in charge of the URLResolver has ceased working on any Kodi addons, it’s now being maintained by the TVAddons team. To get the latest version, click the gear icon on Kodi’s main page, then select File Manager. At the bottom of the list, click Add source and enter the following (without quotation marks) into the top box: “http://fusion.tvaddons.co”. Next, return to the start screen and click the Add-ons tab, followed by the box icon in the top-left. 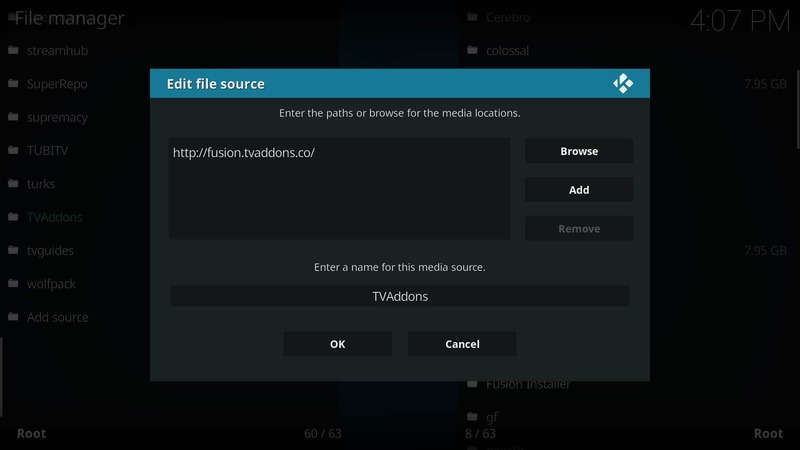 Click Install from zip file, then choose the TVAddons source that was just added. Inside the Kodi scripts folder, you’ll find a file named “script.module.urlresolver-X.X.X.zip” where X refers to the current version number. Just click this to install the latest version. Problems with Kodi’s Database or UserData folders. Kodi allows its advanced users to create and browse their own databases. The vast majority of Kodi users won’t do this, but everybody runs into scripting problems from time to time and it’s always useful to know how to fix any errors that can occur as a result. The solution to this problem is very simple. If you delete the Database folder, Kodi will create a new one and the code that caused it to crash will be removed. Now, the location of this folder changes based on what platform you’re using. Find your operating system in the list below, navigate to the specified location and delete the Database folder. If the issue persists, you might want to try deleting the UserData folder as well since any incorrectly edited files here can also cause frequent crashes. Database folder: Click the Windows icon and type “%APPDATA%\kodi\userdata” without the speech marks. UserData folder: Click the Windows icon and type “%APPDATA%\kodi\userdata\Database” without the speech marks. This is an issue that usually only affects portable devices like the Raspberry Pi and can often be overlooked due to its ability to only manifest in specific conditions. Insufficient power supply isn’t technically a Kodi problem, but it can often be misclassified as one because it might only happen when Kodi is running. If your power supply isn’t powerful enough, it’s possible that Kodi will be able to start and perhaps even work for a while before the entire device turns off and reboots. This is because while you might have enough power to sustain the device, it’s too weak to supply the power needed when the device is under heavy load. Luckily, the solution is simple. You need a better power supply. For the Raspberry Pi 3, you need a supply capable of providing 2.5A at 5V. Cell phone chargers usually fall just short of this, so if you’re using one of these with your device, it’s likely that’s why it is rebooting. Hopefully by now your Kodi rebooting issue has been solved and you’re free to enjoy your favourite TV shows, movies, and sports coverage in peace. If you’re experiencing other Kodi issues, feel free to check out our guide to fixing the most common Kodi problems and our article on reducing choppy video playback.